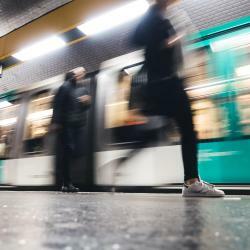 Looking for hotels near Corentin Celton Metro Station? Beau Séjour provides both a homestay and a self-catering studio located in Issy-les-Moulineaux, the southwest residential suburbs of Paris. All the accommodations provides free Wi-Fi access. Located next to the Porte de Versailles, Hotel Izzy by HappyCulture offers rooms and free WiFi. Rooms are decorated with dark wooden furnishings, air conditioning, hairdryer and flat-screen TV. Les Suites de Vanves is located in Vanves, on the outskirts of Paris. Located in the South of Paris, just 8.1 mi from Orly Airport, Novotel Suites Paris Expo Porte de Versailles is a few yards from Porte de Vanves Metro Station, which leads directly to the city center. Location close to metro, price is good and good with kids. Porte de Versailles Hotel is located 1969 feet from Porte de Versailles Exhibition Center, and it offers design rooms just 2133 feet from Balard Metro Station. I was very impresed with a hotel. Everything was so clean and the staff was really frendly. This ibis hotel is 1.2 mi from Paris Porte de Versailles Convention and Exhibition Center. It offers 24-hour reception, a elevator, bar, and Wi-Fi is free of charge in the entire property. Very comfortable bed and ultra friendly Front Office team and General Manager. Vice Versa hotel, which is less than half a mile from Porte de Versailles Convention Centre, was made by designer Chantal Thomass and inspired by the seven deadly sins. Amazing place to stay, so atypical hotel. Love every details. Located 0.9 mi from Porte de Versailles Exhibition center, opposite Georges Brassens Park, Hôtel du Home Moderne offers contemporary rooms with free Wi-Fi internet access. We LOVED this hotel!! Impeccably clean, wonderful breakfast, comfy beds. Loved the location. Hotels with great access to Corentin Celton Metro Station! Set in a 20th-century building in central Paris, Chouette Hotel is just 1312 feet from Georges Brassens Park. The Porte de Versailles Exhibition Center is 0.9 mi away. Simple perfect! Everything was so nice! Centrally located 2625 feet from Porte de Versailles Exhibition Center and 1.7 mi from the Eiffel Tower, this convenient hotel offers friendly and personalized service, and free WiFi access. The staff was amazing and very helpful. The room was spacious, with a little balcony. Mercure Paris Boulogne is located a 10-minute drive from Paris and an 8-minute drive from Paris Expo Porte de Versailles Exhibition Center. Clean, affordable and comfortable. Hotel Paris Vaugirard is located in Paris, 164 feet from Porte de Versailles and the main entrance of the Parc des Expositions. It offers free WiFi access. I loved everything about this hotel. Mercure Paris 15 Porte de Versailles is located in a quiet street, 0.7 mi from Porte de Versailles Exhibition Center and 1.7 mi from the Eiffel Tower. Everything else was fantastic.